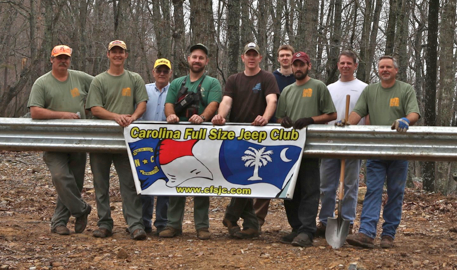 The Carolina Full Size Jeep club was started in 2006 to give Full Size Jeep enthusiasts a way to meet other enthusiasts from North and South Carolina. The club really has no bounds though, as we have users and members from other surrounding states. The CFSJC has hosted the “East Coast Invasion” every year since 2006, at Uwharrie National Forest in Troy, NC. FSJ’ers from all over the southeastern states come out for this event. The club has also adopted trail 96A “Dickey Bell” at Uwharrie. We work with the Forest Service doing trail maintenance and clean up trash and debris. (Starting in 2012 Dickey Bell is now trail 91). If you have a love for Full Size Jeeps, this is the place for you! Please access our Message Boards via the Forums link at the top!